Ideas and suggestions about how to be less at risk when living in a bushfire-prone area and other related land management topics in SW Australia. 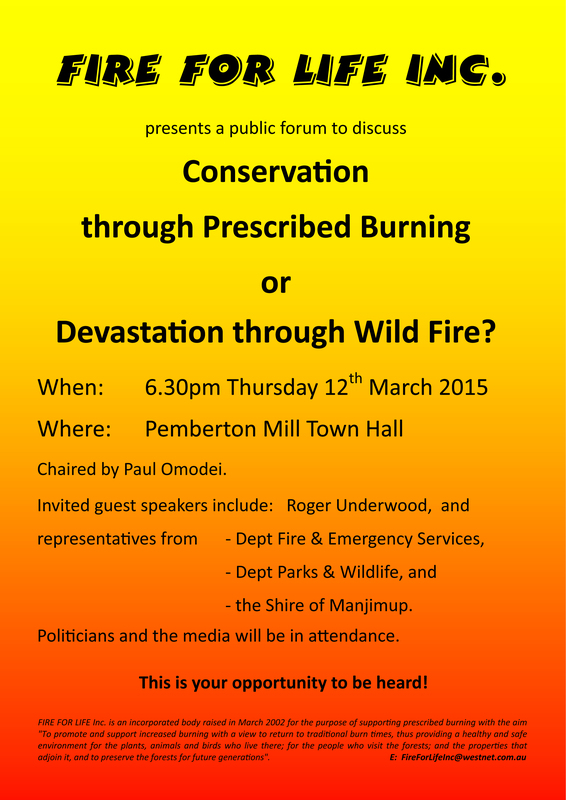 Here in the South West of Western Australia, where we have just survived a fire season with many bushfires, the topic of prescribed burning has been debated. Jarrah forest just 4 kms away from the town of Balingup in the inland SW which has had a recent prescribed burn. Note the blackened trunks and relatively small amount of understory. To many of us who live near forests and farmlands prescribed burning is not at all problematic – it is a potent way to reduce the fuel built up in forests and woodlands. Without this controlled burning of forest litter and other dead or dry material we know that the build up of flammable material will lead to huge, intense bushfires that can travel for kilometres. In one of these intense fires, the recent Northcliffe bushfires, embers were spotting up to five kms ahead and starting more fires. The area near the small town of Northcliffe not far from the south coast of WA has coastal heathlands and further inland large stands of Karri forest, some of it in National Parks. Much of the area is difficult to burn because of its mild climate where it is well into summer before it is dry enough to burn. It can quickly become very dry and dangerous to burn. As a consequence and with limited resources there were some areas that had not been burnt for thirty years or more and there was significant fuel build up. A series of lightning strikes over summer started many fires and most were contained quickly, but not all. With hot, strong winds fires took off and merged to create one of the biggest fires in the State’s history. After the fire there was a community meeting called by the authorities: the Northcliffe Bushfire Debrief. Here are the Minutes Operational 2015 3 10 of this meeting which gives some idea of the enormity and cost of this fire (or these fires). Two days later another meeting was called by a residents’ group to call for more prescribed burning. Poster for Meeting advocating prescribed burning. The newspaper account of the meeting was sent to me as pdfs. There is much to be said about prescribed burning, but the best thing to do is to take action and conduct these controlled burns. The rains have come to the South West in the past few weeks, quite early for the season, in the form of remnants of two cyclones. Not dangerous to us here but bringing gentle, soaking rains. The bushfire risk has passed, it is safe to burn, if a little damp to get the fire started! This entry was posted in Uncategorized by peta2015. Bookmark the permalink.